Price: £1.40 (incl VAT) Sorry, this product is no longer available. 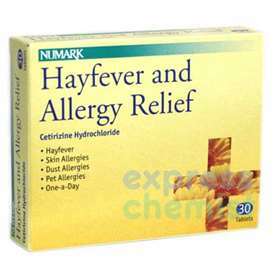 Numark Hayfever And Allergy Relief Tablets - Cetirizine Hydrochloride. For oral use. To be swallowed with water. Adults and children aged over 6 years and over - One tablet daily. CETIRIZINE HYDROCHLORIDE, MICROCRYSTALLINE CELLULOSE, LACTOSE, COLLIDAL ANHYDROUS SILICA, MAGNESIUM STEARATE, HYPROMELLULOSE, MACROGOL, TITANIUM DIOXIDE AND POLYDEXTROSE. TAKE HALF THE DOSE IF YOU HAVE LIVER PROBLEMS. DO NOT GIVE TO CHILDREN UNDER THE AGE OF 6 YEARS. DO NOT EXCEED THE STATED DOSE. IF SYMPTOMS PERSIST CONSULT YOUR DOCTOR. DO NOT TAKE IF PREGNANT OR BREAST-FEEDING. KEEP ALL MEDICINES OUT ODF THE REACH AND SIGHT OF CHILDREN. THESE TABLETS MAY CAUSE DROWSINESS, IF AFFECTED PLEASE DO NOT DRIVE OR OPERATE HEAVY MACHINERY. Product code: 1099209 Price: £1.40 (incl VAT) Sorry, this product is no longer available.